Both of these variables — organizational and tactical — rely on shared performance goals to align campaign execution. Among those marketers who claim to run a ‘best-in-class’ integrated marketing program, 40% have shared performance goals across physical and digital marketing channels. That same group also has higher-than-average collaboration with their agency partners. Beyond internal organization, there are other roadblocks that stand in the way of successful integrated marketing execution. Measurement is a big one. 37% of marketers told us that ‘limited ability to measure the success of campaigns across digital and physical channels’ was their #1 roadblock to implementing an integrated marketing strategy. Marketers across the board – regardless of their primary sales channel – cited the same internal impediments to implementing an integrated marketing program. One-third of traditional offline marketers said a lack of unified measurement processes is the main hindrance to effective measurement. Brands are gathering rich data about their customers, but have limited options for measuring it, which impacts marketing ROI. This is especially critical given the array of channels marketers have to measure in order to tell a complete story of the omnichannel consumer journey. – Define shared cross-team performance goals and KPIs to ensure a unified understanding of campaign objectives and measures of success across channels. – Invest in offline measurement tools like location data analytics, to show the link between online campaigns and offline results (or visa versa). – Separate technology from media with dedicated budgets to enable a robust marketing technology stack that can serve offline and online functions. 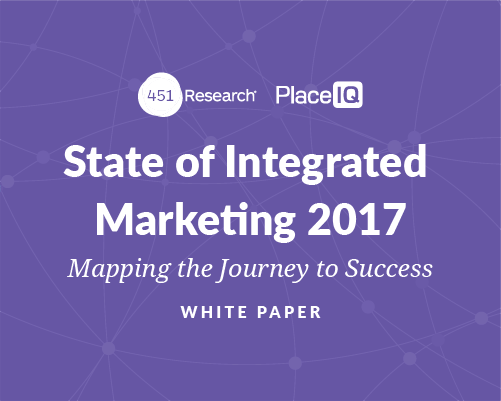 For even more on the state of integrated marketing across the industry, download our whitepaper.